Anyone who has a big lawn understands the hassle of raking your lawn for hours and being left with aching muscles. Over the course of a year, the effort you put into raking can become more taxing. To save time and energy, consider renting a leaf blower. Leaf blowers collect lawn debris quickly and remove leaves from the lawn with less physical effort. However, leaf blowers are bulky pieces of equipment, and can require some upkeep, so renting can be an efficient solution to your lawn maintenance needs. Leaf blowers are versatile machines. They can be used year round from autumn leaf cleanup to driveway sweepers during the spring and summer months. Leaf blowers are grouped into three categories based on the power source. The source of power for your leaf blower will affect the maximum power and reach that the blower will have. The first type is the cordless leaf blower. Cordless leaf blowers operate off a rechargeable battery. The benefit of a cordless leaf blower is that it is quiet, and is as mobile as gasoline mowers, but they can lack the level of power other leaf blowers have. The battery must also be recharged so time of operation is also limited. The second type of blower is an electric leaf blower. Electric leaf blowers are more powerful than cordless leaf blowers, but they must be plugged into a power source in order to work. The benefits of this type of leaf blower are the lightweight and the small amount of maintenance. Gas leaf blowers offer the most power and are perfect for large areas. However, gas leaf blowers are heavy and often do not come in hand held styles. They also make a lot of noise in comparison to electric and cordless blowers. Gas blowers also require fuel mixing similar to weed whackers to run efficiently. Every model of blower has the ability to serve different functions such as vacuuming, bagging mulch, cleaning gutters, or spraying trees. The bigger the blower, the more noise it will make. 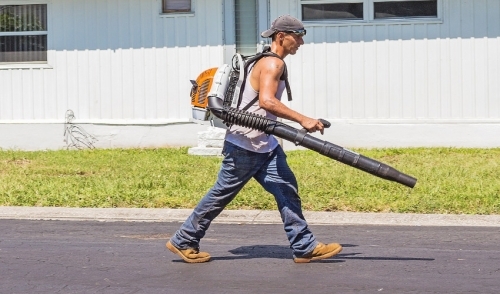 Some towns will have restrictions on decibel levels and hours of operations, while other areas may not allow the use of leaf blowers altogether. When using a leaf blower, be sure to keep the interior free of debris and the handle of the blower dry. This will help you maintain a good grip while operating the machine. For safety, avoid running the blower near other people, particularly when small children or pets are present. The discharge of the blower can throw objects such as rocks at high speeds causing serious injury. Never point the blower at anyone and always wear safety equipment for protection.